Magnesium helps overcome tiredness and reduce fatigue. It also contributes to electrolyte balance, normal energy metabolism and normal nerve and muscle function. Magnesium contributes to normal protein synthesis, normal psychological function and the mineralisation of teeth and bones. It also influences cell division. pH alkaline/neutral. Moderate laxative. 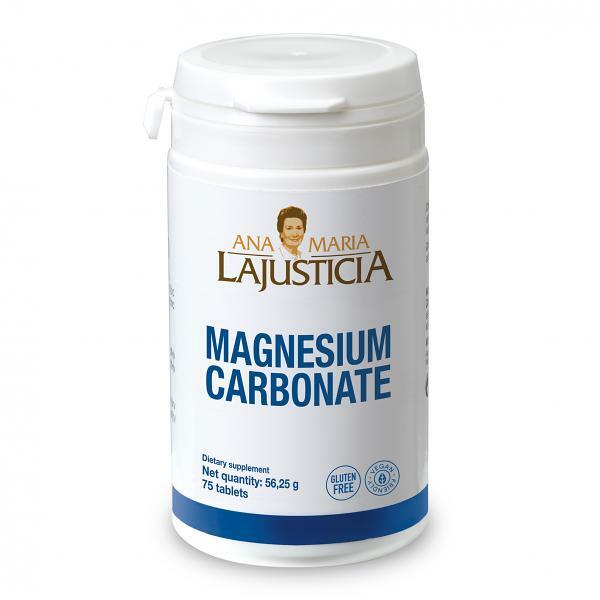 Magnesium deficiency (pregnancy, breastfeeding, puberty, old age, anxiety, cramp, twitches, muscle contractures. Essential in the maintenance of healthy cartilage, tendons and bones, and to repair wear. Also as a supplement in deficient diets. Recommended to counteract heartburn and in the treatment of hiatal hernia. Take 2 tablets a day. Average content per daily dose of 2 tablets (1.5 g): magnesium 300 mg (80% NRV*). Magnesium carbonate, anti-caking agents (microcrystalline cellulose, magnesium salts of fatty acids).